As noted by 9 to 5 Mac, titles from publisher Random House have already started populating Apple's iBookstore, at least in the United States. 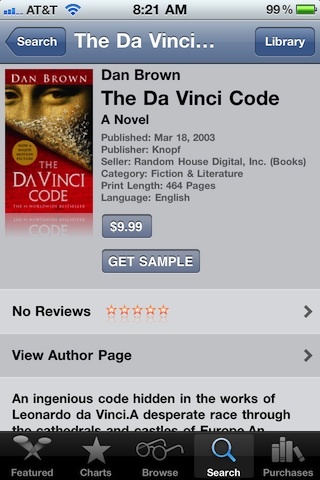 Popular titles such as Dan Brown's The Da Vinci Code that have been absent from the iBookstore since its launch nearly a year ago are now available. Random House yesterday announced that it has adopted the agency model favored by Apple for e-Book pricing, of course leading many to assume that the publishers content would be making its way to the iBookstore. Random House is the last of the six largest book publishers to come to the iBookstore, and it seems likely that Apple will make mention of the addition at today's media event.